Intense has restructured its business for the third time in four years. The new name is Intense LLC, and it brings together both assistance and investments from like-minded individuals in the motorcycle business. Jeff Steber will remain in control as CEO. It's no secret that Steber has been searching for the right mix of corporate savvy and grass-roots support in an effort to grow the brand internationally without losing their connection to the loyal, hard-core riders who were responsible for their initial success. Steber couldn’t conceive of such thoughts. He held his ground and Intense Factory Racing scored a second place at Fort William with Australian Jack Moir aboard the 29er prototype. Months later, he retook the reins of Intense as the CEO and vowed to refocus the brand on racing development. Taking a step back to realign Intense with its passion for racing turned out to be a positive move for the brand - at least for the short term. That said, Steber and company are well established as innovators with a passion for racing. What they have yet to figure out is how to follow that path without ending up in the same place. “Win on Sunday, sell on Monday?” Translating podiums to purchases is not that simple. Nobody is making bank selling downhill bikes these days. If you had access to the numbers, you’d be surprised to discover how few DH bikes are sold annually compared to the millions spent on downhill racing. Race teams are advertising businesses, pure and simple. Winning is the job, but the purpose is to elevate brand awareness. 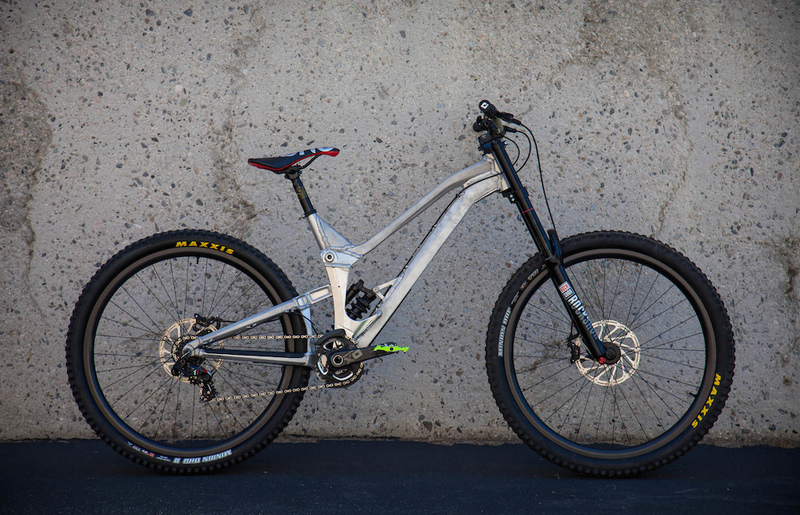 For a bike sponsor, a World Cup DH team pays the bills by selling trail bikes – lots of them. Jon Erik “Jeb” Burleson and Christy LaCurelle get that. Jeb’s father was a professional motorcycle racer. He joined KTM North America’s motorcycle division right out of college and was president for a good part of his 15 years there. Christy put in almost a much time there in motorsports marketing, much of which was working with race teams. She also put together and ran KTM’s youth half-time Supercross racing program. They later formed the Two Wheel Group, a consulting agency which would soon become an integral part of Intense’s future. A chance meeting a number of years ago brought Jeb and Jeff Steber together. Jeb, an avid mountain bike rider, was on the way to KTM, which was also in Temecula, when a passenger suggested that they roll by Intense. Jeb was impressed by the factory and wanted to become involved right away, but the timing was not right. Steber and Burleson remained in contact, however, and eventually, Jeb joined the board of directors at Intense in January 2018, where Steber came to appreciate his frank assessments of their mountain bike business, and more so, that Burleson understood the importance of the brand’s racing heritage.“Originally, Jeff asked me to do some consulting work,” said Jeb. “Then later I joined the board, where I basically worked to restructure the finances to give us a runway forwards. Now, it’s been almost exactly one year since we have been working on this project [Intense LLC].”So, are there big changes in the works? Surprisingly not, which was refreshing to hear. Steber says that they are on a more conservative path that begins by executing their day to day business more efficiently and more importantly, focusing more sharply on Intense’s core customers. To begin with, they are rolling out “Intense Podium Payback" - a contingency plan to reward pro and amateur race winners at selected local and national race venues. Jennifer Gabrielli, who runs that program, tells us that Pro riders receive cash, while amateurs get vouchers for products redeemable on the Intense Rider Direct web store, and as the plan matures, at Intense retailers. The Podium Payback plan was launched locally at the Fontana, California, winter DH series and predictably, it’s a hit. On the business side, Jeb says that the traditional sales model has flipped. Originally, the relationship between the bike brand, and its retailers was that the brand marketed its overarching message, while the retailer was responsible to generate the sales. “Now, all of a sudden, that is changing and we have to make that sale,” says Burleson. “Making the brand seem cool and having people recognize us isn’t enough. Now we have to go one step further and get them to buy – whether that is a click or a door-swing. We call that performance marketing – where we don’t just deliver a message, if it’s social media or whatever, we provide a click-through or an immediate opportunity for that person to make a purchase.”Jeb believes that the role of the new retail dealer is to be the confidant who provides knowledge, support and service. “Buying a new mountain bike – talking about it, comparing, geeking out on components, having it worked on – it should be super fun,” he says. “If we can shape purchasing our bikes into that positive experience, then it doesn’t matter whether they buy it from us through Rider Direct, or if they buy it from a retailer, we’ve done our jobs.” Arguably, a significant portion of the Intense experience is buying into an ideal that is larger than life, which brings us back to World Cup racing. is doubtful that either would invest substantial sums to subsidize Intense’s desire to go World Cup DH racing without an ironclad business plan that included athletes who could deliver top-step performances.“The number one thing that we had to do with this restructuring was to become extremely relevant in World Cup downhill,” states Jeb. Easier said than done. If racing was their true north, once Intense LLC committed to that path, anything less than a successful World Cup Team would be suicide. Expensive? You bet. Reportedly the deal required nine months of back and forth between investors, athletes, and Intense. The team announcement posts tomorrow morning. It’s certain that Intense fans will applaud a triumphant return to their racing roots, but will it be enough? Most of the brand’s storied history took place before millennials and Gen-X riders bought their first mountain bikes. Once again, Jeb puts it bluntly: “You are only as good as your last win. It’s the same for racing, business, or life. The moment you stop moving forward and start talking about what you’ve done, you are no longer relevant.” The new Intense team has a good track record with both generations and they’re betting that a successful show at the World Cups will engage younger riders, new to the brand. Providing most goes as planned, what will Intense LLC become five years from now? Well, it turns out that Jennifer Gabrielli and Christy LaCurelle are already at work curating the brand’s future. Jennifer, by reaching out with the Pro Payback program to support racing at the local level and to reward weekend-warriors who paid for their Intenses and live to race. Christy, based upon the enviable success of her KTM youth racing program, is working out a future racing venue designed to bring younger riders into the fold from the day they learn to ride. Both programs come at a good time. The average age of a Pinkbike member is now thirty-something and a lot of us have kids. If the new race team gets the job done, a lot of riders are going to become first-time customers. Founder Jeff Steber’s first motto was “Intense for Life.” Podium Payback and an upcoming youth racing series could be the best insurance for the brand that this new crop of riders are exactly that.